If you haven't figured out ways to help you manage your Christmas stress, don't worry you're not alone. Every year thousands of people across the world suffer from what I like to call, Christmas stress. No, Christmas stress is not a medical term. However, every year thousands of people find themselves suffering from an insurmountable amount of stress during, and leading up to Christmas. For some people, the seemingly endless holiday to-do lists is what triggers their seasonal anxieties. While other people blame the gift giving demands and family expectations for their stress. There are other reasons as to why people find themselves more stressed out during Christmas than any other time of year such as: loneliness, divorce, grief and or toxic relatives. However, to manage the onset of Christmas stress it's important to recognize the signs so that you can know what to do if and when and it happens to you. One of the best ways to prevent Christmas stress is to set clear boundaries both for you and for others. Try your best not to take on more than you can handle such as: cooking, holiday shopping or gift wrapping. Enlist support from your family, friends and loved ones. There is nothing wrong with asking the people you love for help. This support can be practical or emotional but it really helps to spread the load and to ensure that other people are aware of your needs. Simply expressing your needs to the people closest to you can make all the difference. Not only will it help you minimize your stress levels, but it will also bring you and your family closer. The alternative is not saying anything, which will only bring about more stress and more resentment. Christmas is one of those holidays where everyone is expected to be happy and in a celebratory mood. However the reality is that the holiday season, particularly Christmas often brings about unwelcome guests, financial strain, and showing up for parties and events when you'd rather stay at home. Exercise in either a gentle form such as Qigong or Tai Chi. Or try a more vigorous exercise such as jogging, both have been shown to be effective when dealing with stress. Yoga has been known to be an excellent antidote to stress and anxiety. According to the Mayo Clinic, the physical and mental discipline yoga offers helps you to relax thereby allowing the body to de-stress. Meditation has also been proven to minimize stress. The idea is that as you focus your attention on your breathing, your body begins to relax, thereby allowing you to gain control of your thoughts. When you become aware of your thoughts you can control what you think. So, if you find yourself spiraling out of control, stop and begin meditating. Visualization and imagery is another way to dramatically diminish stress and anxiety, particularly in anxiety prone individuals. The idea is that you focus your attention on something else such as a sunny day on a sandy beach whenever you feel stressed. Thus you are tricking your mind to be somewhere else even when you are not. To conclude, all of the techniques above will help you create the space and time you will need to get through the Christmas season stress free. However in order for any of these techniques to work, it's important for you be mindful of your stress levels. That said, do keep your expectations low for the holidays. Too often people set their Christmas expectations so high that they become stressed out just thinking about all the plans they made. Letting go of the belief that Christmas has to be perfect will immediately help to diminish the weight of your expectations. That means even when someone in your family is not behaving like an angel, the turkey refuses to cook, or the store just ran out of that perfect gift you picked out for your husband or wife, you will be able to handle it. 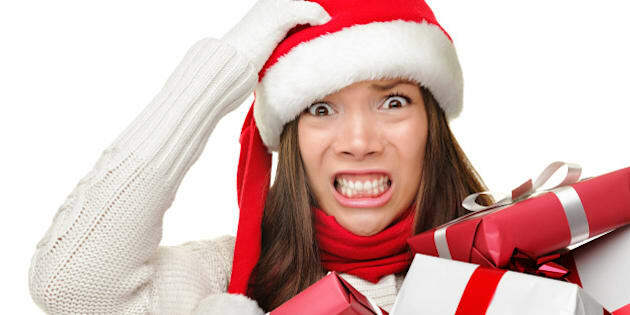 Managing your Christmas Stress is all about eliminating the things that create emotional, mental or emotions stress. And, when you keep your holiday expectations in check, you are more likely to create a Merry Christmas that ends stress free. Happy Holidays!